I am lost again. Just hours after I posted my last blog about detours on the road and in life, I once again took a wrong turn. This time I was in the Target parking lot. Yes – you read that correctly – the Target parking lot! As usual, I turned left when I should have turned right and the parking lot came to a dead end – and this is what I found. Just take a look at the photo I posted here. Take a close look. 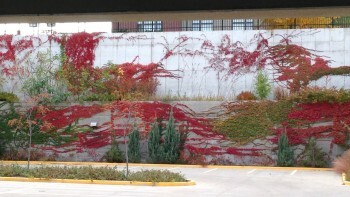 Its vines intertwining and creeping along this wall, blazing with fall colors. What a spectacular site and I couldn’t help but stop, get out of my car, and just enjoy. Absolutely beautiful! The sad part is that I was the only one there. Everyone else turned right, just like they were supposed to, and they missed this amazing sight. They didn’t take the detour – what a shame. Today I stand out from the others, lost once again and enjoying every minute of it. Today I am grateful for my lack of direction.